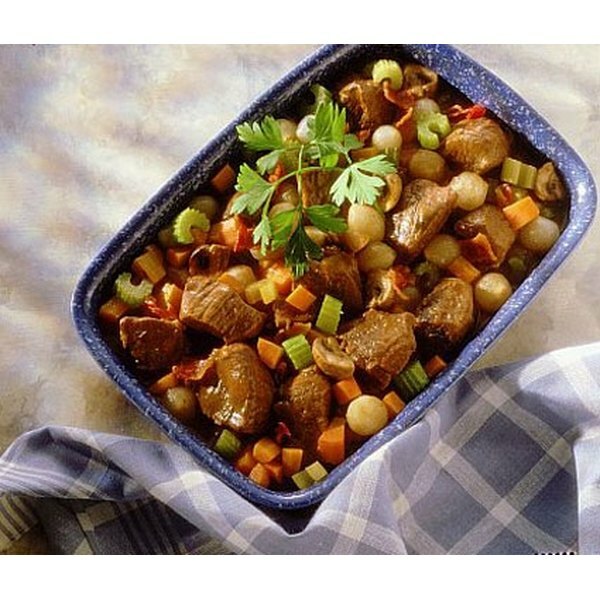 Beef Bourguignon is a hearty and delicious meal to have anytime. A quicker version of this classic can be made using a Crock Pot for those evenings that are busy, ensuring that your family will still get a nutritious meal even when you don't have extra time to prepare one. 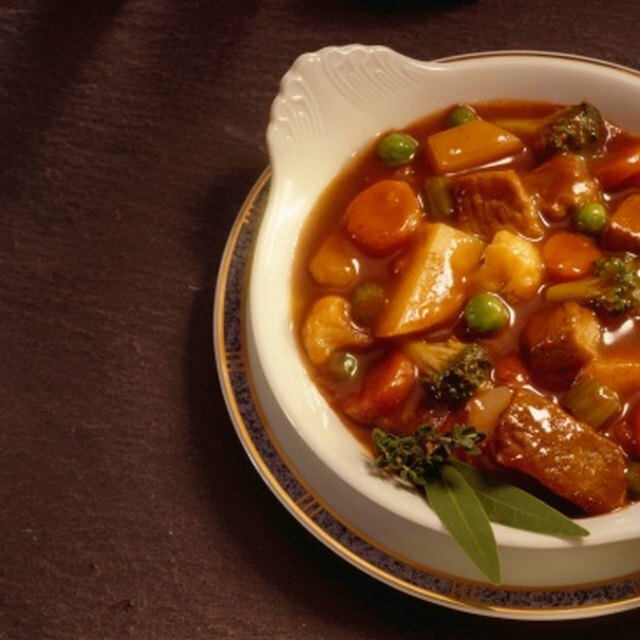 Combine the flour with the stew meat and mix until all the cubes are covered. Season with salt and pepper if desired. While the meat is in the mixing bowl, heat 2 tablespoons of butter in a large frying pan, and brown meat in batches. Once all the meat is browned on all sides, combine all of it to the frying pan. Add wine, broth, garlic and bay leaves to the pan and simmer for 1 hour, or until beef is tender. Melt 1 tablespoon of butter in a separate pan and saute onions, carrots, and celery until they are browned and set aside in a large bowl. Add a second tablespoon of butter and saute the potatoes until they are browned, and set aside along with the celery, carrots and onion. Melt a final tablespoon of butter and saute the mushrooms until they are browned. Combine all cooked ingredients into the large bowl. Add the cooked vegetables to the frying pan that is holding the meat and sauce, and simmer once again for 45 minutes with the lid on the pot. Once the 45 minutes are up, remove the lid and bring to a boil for about 5 to 10 minutes, so that the sauce can become thickened. Season with salt and pepper if needed and serve.